A brief collection of writings about art that are actually about the difficulty—even the impossibility—of writing about art. “Sometimes things of beauty are inadequately perceived,” Walser (1878-1956) understates in “The Van Gogh Picture,” before concluding about his initial attempt to write about that picture, “the content of this essay has now escaped me, for which reason the desire came over me to renew it, which has now been done,” leaving readers knowing less about the Van Gogh in question than about the flights of the writer’s fancy. The novelist and poet was, the introduction explains, much influenced by his artist brother, the subject of “Scene from the Life of the Painter Karl Stauffer-Bern,” in which a footnote says that Karl had “a scandalous affair with his patron.” The piece deals with that relationship in the form of dialogue between the two, while the opening piece of the collection, “A Painter,” is an interior monologue about a similar attraction between painter and patron. While functioning less like a critical essay than a fictional short story, it nonetheless deems the poet’s art a lesser one than the painter’s and ponders the impossibility of love and art coexisting. “Love wants nothing to do with art, at least the sort of love I feel,” insists the narrator, who will abandon his lover rather than his art. 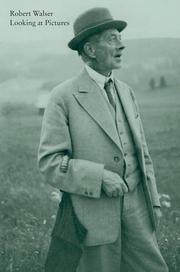 “Love is a form of squandering, art of saving.” While this story is fully realized, many of the pieces are much shorter, a page or two, and read more like fragments, or, as the author terms one, a “tiny, infinitesimally small little essaylet.” A biography of Walser by Bernofsky, the primary translator here, is slated to follow. Allusive and elusive, these essays by the acclaimed Swiss author often concern themselves with anything other than the art they purportedly analyze.